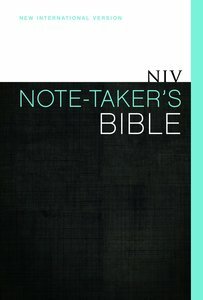 About "NIV Note Taker's Bible"
Finally, a Bible that has plenty of room for taking notes during public or private worship, small-group fellowship, or any other time or place you feel the need to wirte your insights in the Bible. No more cramped writing in tiny margins---the NIV Note-Taker's Bible makes it easy to stay organized and neat. Personalize the text of God's Word to your life as never before, and treasure this record of your spiritual journey. Includes the complete text of the bestselling NIV translation.